Although many people think of bacteria as harmful or dangerous, some types of bacteria actually help your body. Probiotics are good bacteria that eliminate disease-causing bacteria and promote good health. Although some people take probiotics to improve gastrointestinal problems, you should talk to a doctor before taking a supplement to help bloating to ensure it is safe. There are a number of probiotic supplements used by alternative medicine practitioners. Common probiotics include Lactobacillus acidophilus, Bifidobacterium bifidus and Lactobacillus GG. These probiotics come in tablet, liquid or capsule form. 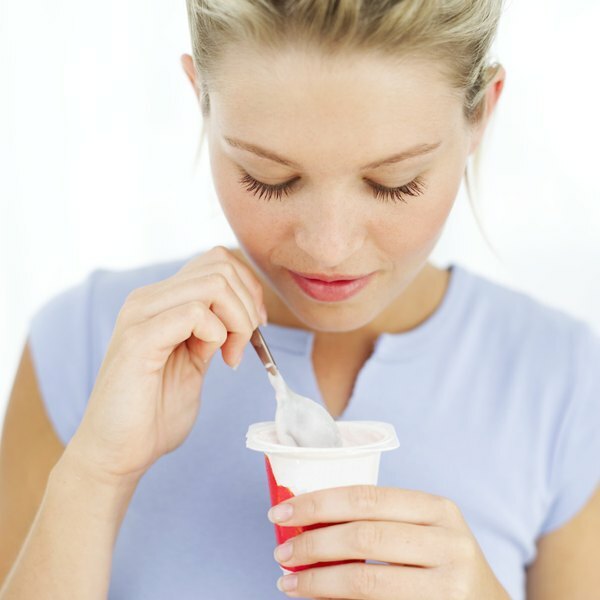 Some commercial yogurt products contain strains of live, active probiotic cultures. People sometimes take probiotics in conjunction with antibiotic medications to repopulate the gut with helpful bacteria. Other medical uses of probiotics include the treatment of infectious diarrhea, irritable bowel syndrome, inflammatory bowel disease, vaginal infections and skin infections. Several studies have examined the use of probiotic treatment for bloating associated with irritable bowel syndrome. A meta-analysis of these studies conducted by Nourieh Hoveyda, a researcher at the University of Oxford Center for Evidence-Based Medicine, found that probiotic treatment may improve bloating in people with irritable bowel syndrome. The probiotic strains used in these studies were Streptococcus faecium, Lactobacillus GG, Lactobacillus rhamnosus, Bifidobacterium breve, Propionibacterium freudenreichii and the supplement VSL 3. Other studies did not find that probiotics improved bloating. More research is needed to determine whether probiotics are an effective treatment for bloating not associated with irritable bowel syndrome. Taking probiotic supplements can cause several side effects. A common side effect is abdominal discomfort or bloating, meaning that probiotic treatment could exacerbate bloating problems. Other side effects of probiotic treatment include gastrointestinal problems and flatulence. Discuss the risks and benefits of taking probiotic supplements for bloating with a physician to determine whether they are appropriate for you. People experience abdominal bloating for a variety of reasons. Weight gain, constipation, lactose intolerance, overeating, air swallowing, bacterial overgrowth and irritable bowel syndrome may cause bloating. Taking probiotics may help relieve bloating for some of these conditions but not others. Discuss your bloating with a doctor to ensure it is not a symptom of a serious medical condition. BMS Gastroenterology; A Systematic Review and Meta -- Analysis: Probiotics in the Treatment of Irritable Bowel Syndrome; Nourieh Hoveyda et al.